Community Life - Awards and Recognition! We value the health and well-being of all our residents, staff members and supporters. To show our appreciation to our caring community we make a commitment to our neighbors, professional organizations and friends. And they return the favor with awards and recognition for our work and service. We are so pleased to announce that Pratyush Sridharhas earned the California Association of Health Facilities 2017 Youth Volunteer of the Year. He was selected for this statewide award for his work with the residents at Lincoln Glen Nursing Facility. Pratyush will receive his award at the 2017 Summer Conference at Long Beach, California in July. A local High School Student, Pratyush has been an active and innovative volunteer for our residents. He is very worthy of this recognition. The award letter states, "CAHF’s Volunteer of the Year Award gives us the opportunity to publicly recognize wonderful individuals like Pratyush who enrich the lives of others through volunteering at long-term care facilities." Pratyush has been a steadfast, reliable volunteer for two years. Working for the Activities Department, he participates in social activities for residents, helps with special events. Best of all, he fills in where he is needed supporting residents in a variety of roles. Pratyush is especially helpful during his school breaks. Lincoln Glen joins with CAHF in honoring Pratyush. "CAHF is a non-profit trade association founded in 1950 to serve as a statewide organization for long-term care providers. The Association and its members are dedicated to improving the quality of long-term health care in California through educational programs and proactive advocacy with the Legislature and administrative agencies." To learn more about CAHF, please click this link. "Helping Hands" a volunteer service group of residents who live across the campus including Assisted Living, Memory Care and the Nursing Facility, their families and friends have supported our troops stationed around the world for many years. This year the resident volunteers have received a gracious letter of thanks and a beautiful certificate of appreciation from the US Coast Guard Patrol Forces Southwest Asia, Bahrain for Christmas care packages they assembled for the service men and women. To see a copy of the Certificate of Appreciation and the letter, click this link. Military officers, writing on behalf of the troops say, "Christmas is always a tough time to be deployed, but your donation definitely helped in lifting our spirits and aided us in sending love home during this holiday season....We LOVE it when we can get packages." Heartfelt thanks and appreciation makes its way around the world to the Lincoln Glen community, all of whom help with this important and thoughtful project. Recently, we were so honored to hear from one of the Servicemen who received one of our Care Packages! Click this link to read about Commander Joe Hutchinson, USN (Retired). The Lincoln Glen Skilled Nursing Facility has received an important award for our commitment to improving the lives of nursing home residents. We have adopted Quality Assurance and Performance Improvement methods which meet the Bronze Level criteria of the California Nursing Home Quality Care Collaborative Recognition Program. The Quality Improvement Organization collaboration with Health Services Advisory Group (QAPI-HSAG) mission is to provide the highest quality care to nursing home residents. The work done in each nursing home—from preventing pressure ulcers to other critical care issues—has a profound effect on improving the lives of California’s 105,000 nursing home residents.This important program sets up initiatives that promote better health for seniors, professionalism for staff and information about innovative and proven services that help our family members maintain the highest quality of life and receive the best care available. To see a copy of the award, click this link. The Lincoln Glen Activities Department offers a full calendar of events and activities for community residents every month. Recognized for their creativity and variety, the Activities Department took on a special project in October: Nursing Facility's Haunted House. The California Association of Health Facilities recognized the Activities Department at the 2015 Annual Convention and Expo in November. Lincoln Glen Nursing Facility’s “Haunted House” was selected by CAHF’s Board of Directors as one of three recipients of the 2015 Excellence in Programming Awards! The Excellence in Programming Awards were instituted to recognize individual CAHF member facilities and homes for superior achievement in key areas of long-term care, and to share those success stories with other providers. Lincoln Glen staff members were honored on November 17, 2015 at the CAHF 2015 Annual Convention. The Activities Department received a plaque and the project was described in the CAHF News and press release. 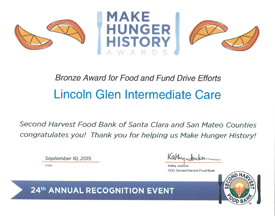 Second Harvest Food Bank of Santa Clara and San Mateo Counties has honored Lincoln Glen volunteers for their strong efforts in their 2015 "Make Hunger History" Food and Fund Drive. Lincoln Glen received the Bronze Award for their food drive at the 24th Annual Recognition Event. Second Harvest Food Bank, one of the largest in the US, distributes more than one million pounds of food each week to low-income people living in all zip codes from Daly City to Gilroy in the two county area. Volunteers contribute more than 316,000 hours of service. Second Harvest delivers food to their collaborative networks of more than 330 partner non-profit agencies. Congratulations to every volunteer, resident and staff member who work in this important project! To see a larger copy of the award, please click this link. Skilled Nursing at Lincoln Glen is a recognized leader in quality care. This year US News and World Reports Health lists Lincoln Glen as a top rated Nursing Home. Information on the website notes that the Rankings and Research review helps "you make informed health decisions for yourself and your family" and includes " ratings in health inspections, nurse staffing; and measures of medical quality of care." We are honored by the distinction. See if Lincoln Glen is right for you. Lincoln Glen has received another prestigious award! This time, the National Research Corporation has honored Lincoln Glen with its 2015 Excellence In Action award. Excellence In Action recognizes skilled nursing homes, assisted living and independent living communities that achieve outstanding resident and/or employee satisfaction. This award is especially significant because the My InnerView database is the largest source of long-term and senior living satisfaction metrics in the U.S.
We are proud to recognize the commitment of these long term care and senior living organizations that successfully measure and improve quality and listen to the true voices of residents, families, and employees. This honor continues our tradition as a caring community, with staff who have committed many years to the service of the seniors who live here. We are proud to announce that Lincoln Glen has received a 2014 Women's Choice Award. Facilities that earned the America’s Best for Extended Care Award had to have 25 or more residents, and have received at least 19 combined stars in the four categories in the Centers for Medicare and Medicaid Services (CMA) five-star rating system. The CMS rating categories are for general and RN staffing, quality rating and inspection survey rating. Recipients must also have Medicare certification, full sprinkler systems and no recent history of penalties or fines. Lincoln Glen Manor is among only 400 facilities to be awarded out of over 15,000 across the nation.